New to the world in 2014 is this Custom Walnut Boomer. My initial thought when designing this model would be that it was an ideal option for those who crave sustain and clear articulation simultaneously. However, the request for certain modifications to this particular model have proven to give even more range and power to this already great model. Here’s a quick review from the owner: “First let me say that the whole process of building this bass with Nick was excellent. I chose the Boomer body design, and from there it was deciding on what woods, hardware and electronics to use. To sum it up, I got everything that I requested. I did not have to change or compromise on anything. I knew that from the combination of all the components that the sound would be really good, but it exceeded my expectations. This bass sings. The action and playability are excellent. All the great standards are here: Hipshot Hardware, Mahogany Body with a Walnut Top, 34″ scale and the soft C profile on the neck. Some of the upgrades that really make this bass really special are the solid quartersawn Wenge neck with a Ebony Fretboard, the Coil Tapped Seymour Duncan Musicman pickup, a Hipshot D-Tuner and the super solid, super beefy Hipshot Brass A Style Bridge. This bass was ordered with a custom reverse headstock with 1+3 Tuners for easy, unfettered access to the D-Tuner. My favorite feature is the Coil Tapped Musicman pickup, it has been strategically placed right up against the bridge for optimum tonal range. Most people would say one of two things to that; “Wouldn’t cramming it next to the bridge cut the volume?” or “Bridge pickups get way too nasally that close to the bridge.” While these concerns are definitely valid in most cases, this configuration defies those rules. With such a hot pickup, it manages to retain full volume capabilities with its height closer to the strings. Also, by seating it right next to the bridge, the tonal characteristics are much more dramatic when switching from the back coil to full humbucker to front coil. On the aesthetic side of this build, I was given the opportunity to take some creative liberties with wood composition and matching covers. I have recently embarked on the venture of bringing psychedelia to woodworking. 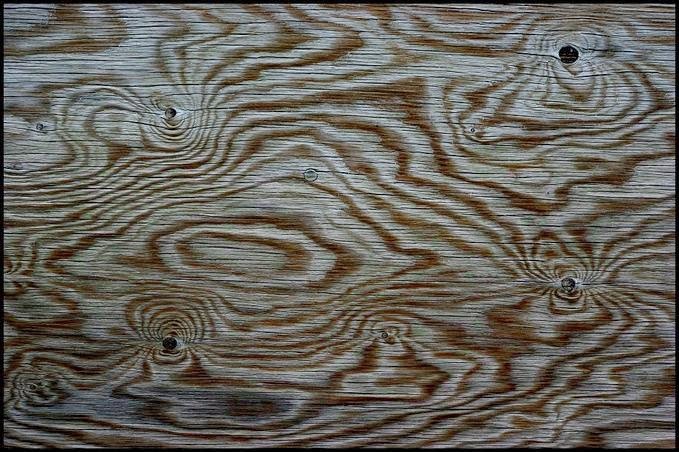 I love the incredible grain patterns that appear in roto-cut plywood.